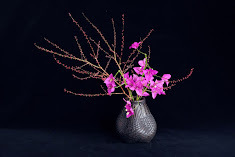 It is actually convenient to explain that Ikebana is a spiritual training. However, how can we convince people of this, especially those outside Japan? How can we prove that creating Ikebana, which is observable is connected to a spiritual enhancement, which is hard to measure? It is probably safe to say that just like meditation or Zen training, accumulating the exercise of Ikebana will affect the human spirit positively. But how can we investigate this issue more scientifically or effectively? First, a socio-psychological approach may work to some extent. Canadian researchers found that those practising Ikebana for more than 17 years are happier that those who are practicing it fewer years. That is a certainly a great starting point for our argument 1. Secondly, it may be possible to describe the Ikebana experience using the Ten Ox-Herding Pictures, a well-known developmental model of Zen. The ten pictures represent ten stages of the spiritual path toward enlightenment. In the beginning, a boy gets a glimpse of the tail of an ox, which is a metaphor of enlightenment. Then he touches it and gradually tames it. Finally, something strange happens to the ox. If interested, please check for more details in the internet or books. Probably it is possible to propose a developmental model of Ikebana training applying this Zen model. Although it is not easy, I think it is quite a promising approach. However, I start to wonder why Zen? It is true that Japanese culture was influenced a lot by Zen Buddhism, but Zen is just one of the factors that affected Japanese culture. I think that describing Japanese culture only from a Zen point of view is wrong and needs to be reconsidered. Typical Japanese art forms such as Ikebana, the tea ceremony and Noh plays were established during the Muromachi period. It is generally believed that the influence of Zen Buddhism had a strong influence on the rise of these art forms. Probably this comes from what history textbooks tell us about Zen and Japanese culture. However, I am a bit suspicious about accepting Japanese history from textbooks. 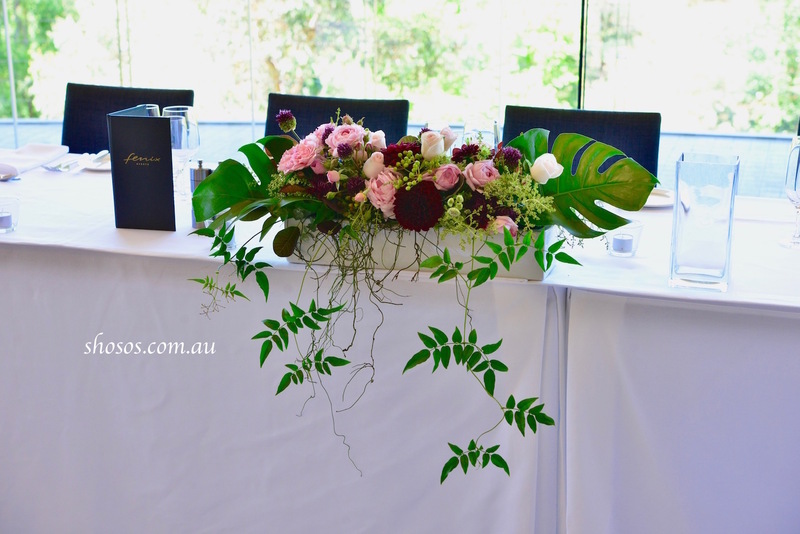 This is a table arrangement I made for a wedding reception. Our clients’ request was to use pink and burgundy as main colours. It was hard to find enough burgundy colour flowers in summer. But our clients were very happy with our works.